Those of you who visit Laburnum Playing Field will have seen the new Fields in Trust plaque (picture attached). This recognises that the land has been legally protected for recreational use, keeping it that way for future generations. We are currently going through the same process to protect Butcher’s Stile. Davenham Parish Council's response to Land to the rear of 28 Church Street planning application - 16 dwellings (past responses can be found further down the page). Our councillors have attended various meetings in the area over the last couple of months to gather information on HS2 . Our final response is attached below. Proposal for a Wine Bar, 500-502 London Road. This planning application has been refused by Cheshire West and Chester. Please find below DPC's full response to this application. Please see latest response from our local MP Antoinette Sandbach. Yet another blow to the village of Davenham. Please see below DPC's letters to Cheshire West in response to the Inspector's report and Chester and local MP Antoinette Sandbach. Please note that the Inspector is totally independent from CWAC and CWAC also refused this planning application. The Inspector's report is below. Please see letter below from our Chair Katie Mattinson with regards to the recent Fountain Lane decision. Two detached houses with detached garage Application reference: 14/02049- For update please see attached document to the recent appeal. Paragraph 119 on page 22 relates specifically to Davenham. This planning application was refused. Please find below the Parish Council response to CW&C in opposition to the proposed housing development off Green Lane. We are pleased to confirm the Planning Officer for CW&C confirmed the planning application for houses on Jack Lane in Davenham was refused on 13th October. The appeal has now been withdrawn! The appeal was allowed by the Planning Inspector. This appeal was allowed by the Planning Insepctor. 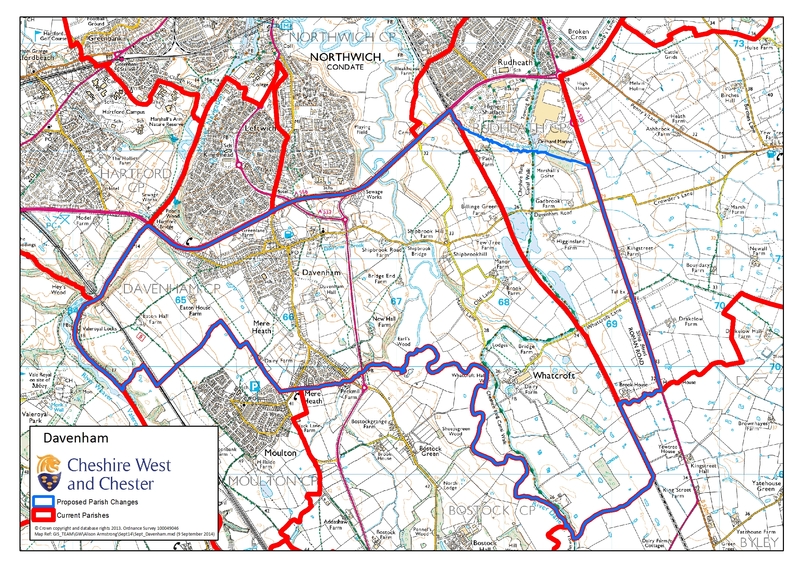 Please find below the Notice of Decision and new Parish boundary maps from CW&C in relation to Davenham & Whatcoft parish.